Thanks to Laura for this Frugal Baby Tip! I have used J-cloths as diaper liners very successfully. They are nice and big, and you can either fold them up and get a bit more absorbency as well as a liner, or you can cut them in 2 or 4 and use them like ordinary liners. You can wash them about 5 times before they start getting really ratty. I'm talking about the J-cloths that feel perfectly smooth and make lousy dishcloths (terrible, because that's what they're meant for) not the brilliant dishcloths that have lots of tiny holes in them and look like a proper woven dishcloth. It's a shame they don't make good liners, because you can boilwash these animals (the manufacturers say 8 times) but I've got cloths here that I've had for well over 18 months, they have been washed and tumble-dried I don't know how many times, and they're still not giving up! Btw, that paper the J-cloths that make good liners are made out of is also called banquetting roll. It comes in huge great rolls for those enormous tables they serve buffets on. If you can find it, (let me know) you could make dozens of liners out of it really cheaply. 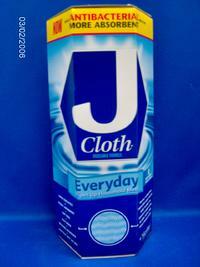 Btw, the J-cloth idea is a good one for if you haven't got any diapers and you're travelling. If you can use a diaper cover again, all very well, but if not, just tie a carrier bag on to keep the folded J-cloth in place. OMG, I just realized this was the blog for Born to Love... I used to run a diaper company and I just loved Born to Love (back in 1999). Thanks for remembering Born to Love!